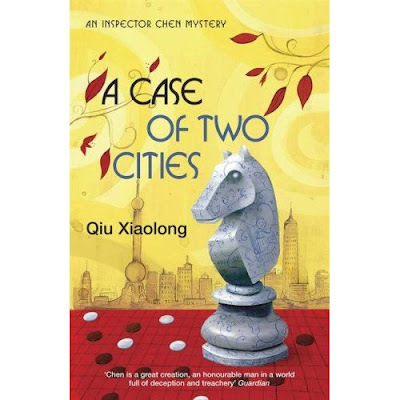 p79:"He passed by a Chinese chess game in front of a dingy hot-water shop. Usually, the players and the audience would smoke, drink, and sometimes eat inside the water shop. The outside location was perhaps due to one of the players,Wong Ronghua, an ex-member of the Shanghai Chess Team, attracting a large audience. Wong, a gaunt, grizzled man, grinned at Chen, revealing his teeth stained through years of bitter tea and poor cigarettes. He straddled one end of the wooden bench, and his opponent perched on the other end, keeping it precariously balanced. The chessboard was placed between them." p83:"The chess game was still going on outside the hot-water shop. None of the audience looked up at him as he passed. He was irrelevant to the battle in the world of a chessboard." p320:"Difficult to say. Perhaps it's like playing go chess. Occasionally you have to move anyway, though the move itself may seem pointless for the moment." After a brief internet search it's still difficult to say what "go chess" is. "Go" in the last quotation, and the whole of the poem in the previous comment, appear in italics. Thanks RGH. I stand corrected. I take it you have the book, then? What do you think? Worth a read?